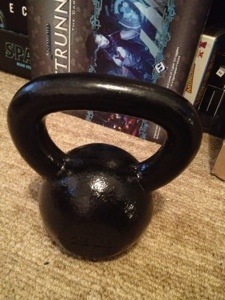 Going in a totally different direction, I decided to take up the Russian kettle bell swing. My husband was reading “The Four Hour Body.” Although I’m not a complete devotee, I liked what I read about the move, beings full workout. Also, my good friend Denise recently got certified (and she has an amazing body through kettle bells) to teach, and she raves about its effects (an she’s a real life transformation). We picked up a 25lb and 35lb kettle ball to start. I’ll report my progress. I’m trying to go in a different direction. I’ll continue running shorter distances (5k-15k). This is really attractive to me, since the time commitment is much less. I’m also going to try to pick things up here at this blog.